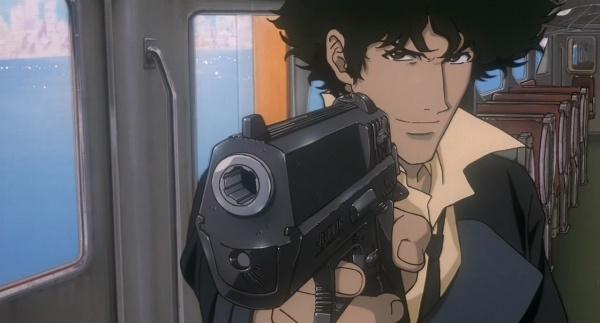 Spike Spiegel's signature pistol is an IMI Jericho 941, with the original =JERICHO 941= stamping and custom grips. Basically, don't call it a Baby Eagle, it's a Jericho, moreover, Spike's Jericho. 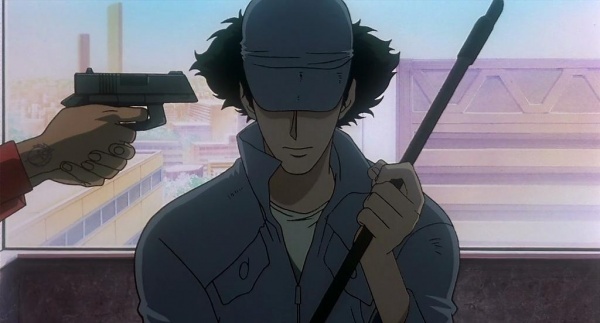 He uses it throughout the film, most notably in the opening scene in the convenient store, and in the battles with Vincent Volaju. 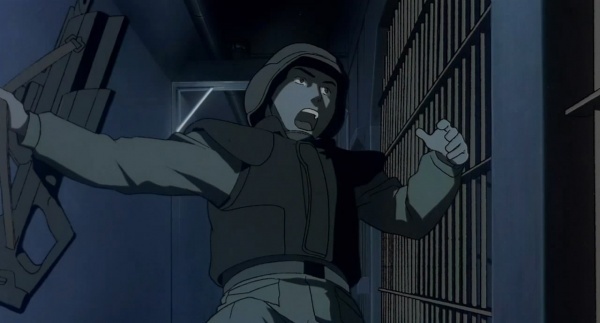 The reference drawing used in the show. 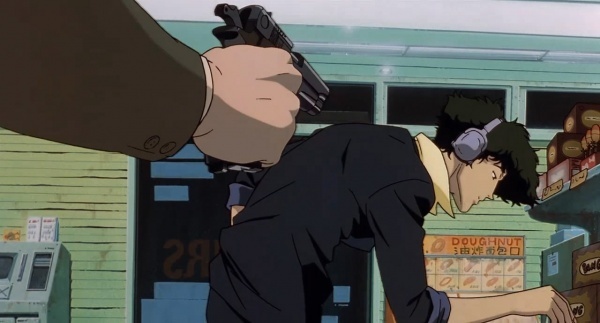 Spike aims his Jericho 941 at one of the convenience store robbers in the opening scene. 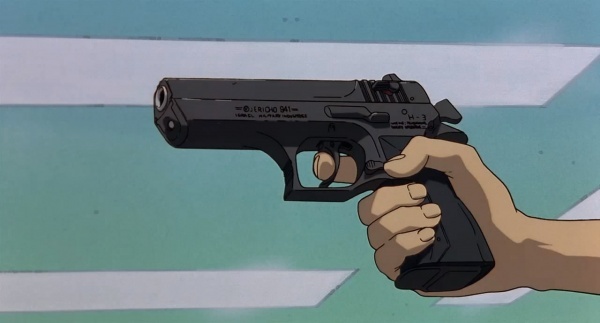 A good shot of Spike's Jericho 941 after taking down the robber. 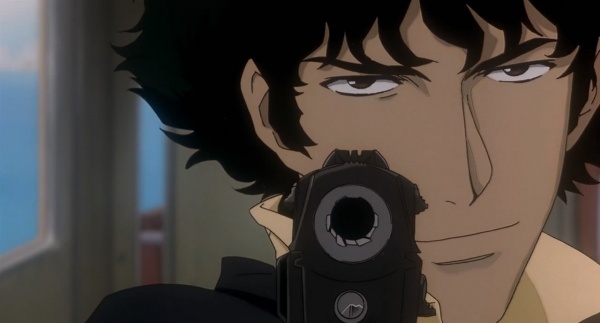 This is probably the best shot of the gun in the entire movie, as well as the series. 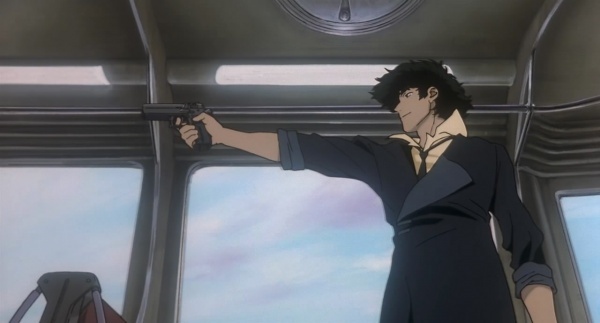 Spike aims his Jericho 941 at Vincent on the train. 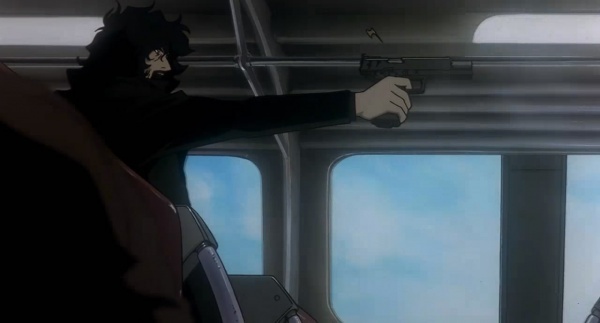 Another shot of Spike aiming his Jericho 941 at Vincent on the train. 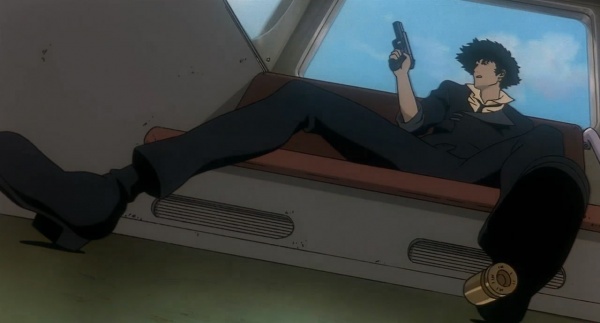 Yet another shot of Spike aiming his Jericho 941 at Vincent on the train. 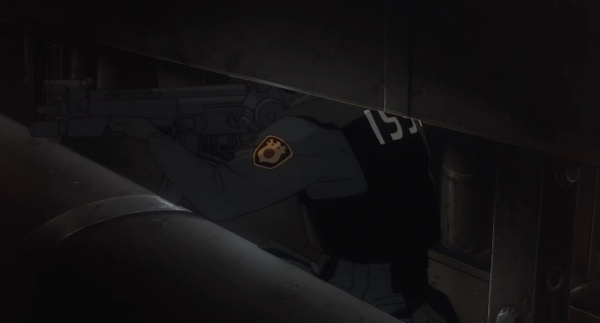 Note that in this and the previous shot, the barrel has rifling grooves, even though the Jericho is notorious for having polygonal rifling in it's barrel. 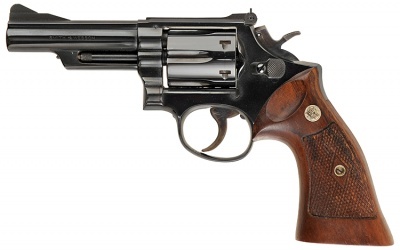 Many later model 941s used a standard rifled barrel due to the designs universal popularity. Same reason the .41 AE caliber was phased out. 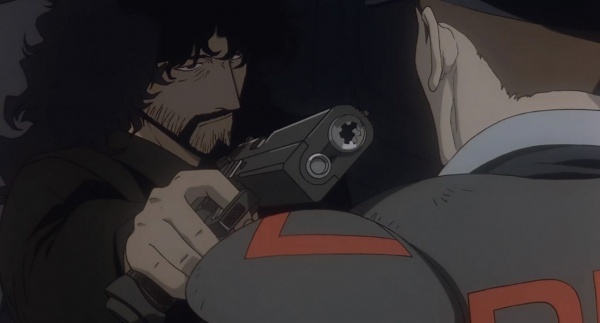 Spike runs out of ammunition after firing at Vincent. The primer appears to be missing from the casing. 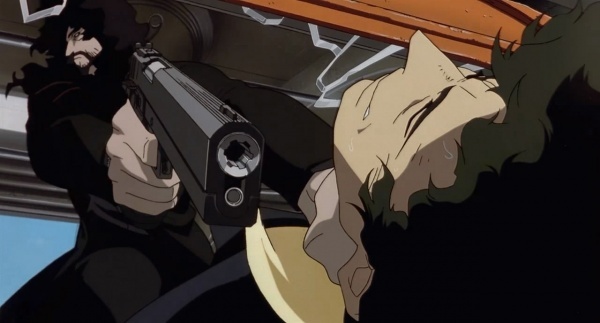 Spike aims his Jericho 941 in the final scene. 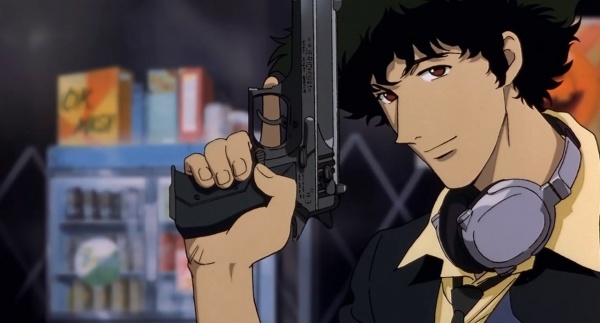 Jet Black's signature pistol is a Walther P99. He drops it after the robber takes the old woman hostage. 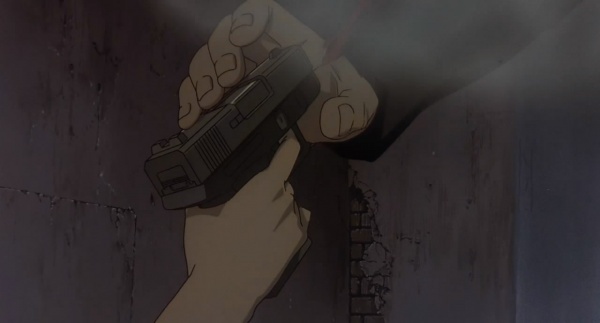 Jet is forced to drop his Walther P99 after the robber takes the old woman hostage. 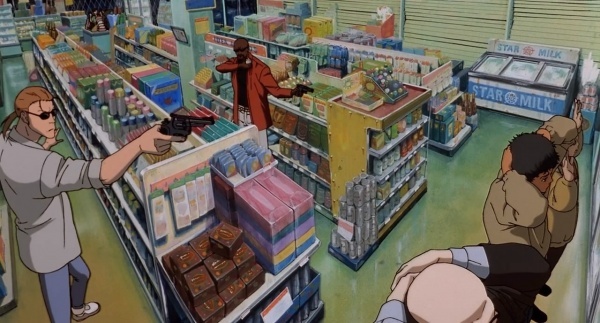 At the beginning of the film, three of the four convenience store robbers all pack Smith & Wesson Model 39-2's, distinguished by their slim frame, First Generation sights, long extractors and holed hammers. 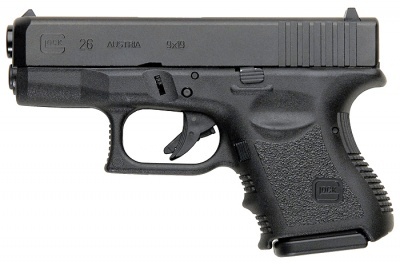 The robber points out with his Smith & Wesson Model 39-2 that the security company that monitors the store was once his employer, but he was laid off and had to turn to a life of thievery. 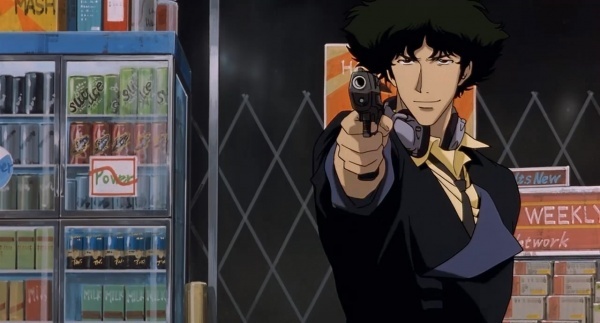 The robber aims his Smith & Wesson Model 39-2 at Spike after he enters the store. 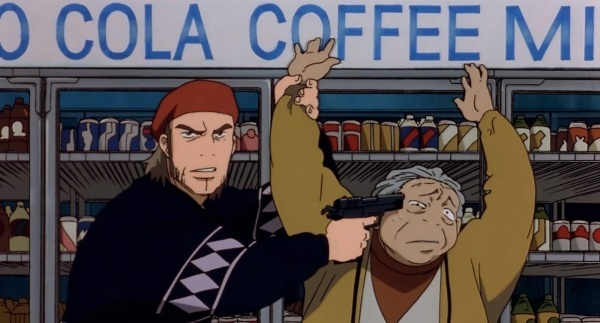 The last robber holds his gun on an old lady after discovering that Spike and Jet have entered the store. 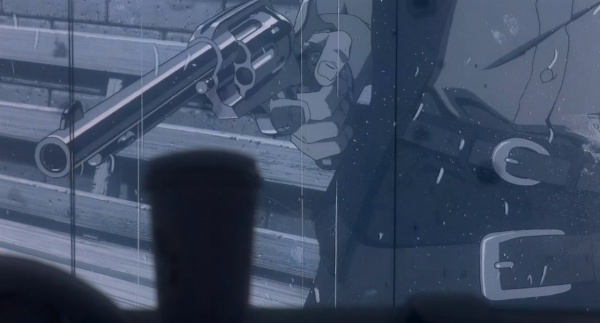 A Smith & Wesson Model 19 revolver is used by one of the convenience store robbers in the opening scene. 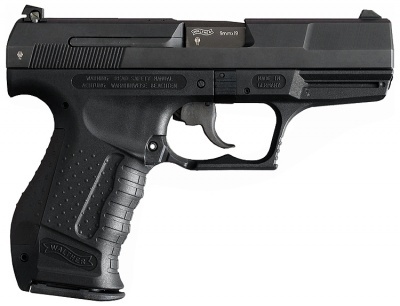 One of the robbers holds his Smith & Wesson Model 19 on the customers in the convenience store. 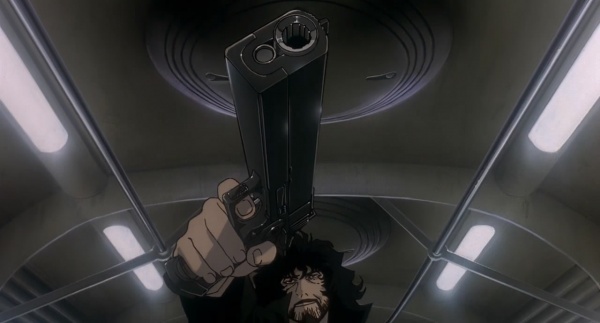 Vincent Volaju carries a Strayer Voigt Infinity 1911 throughout the film. 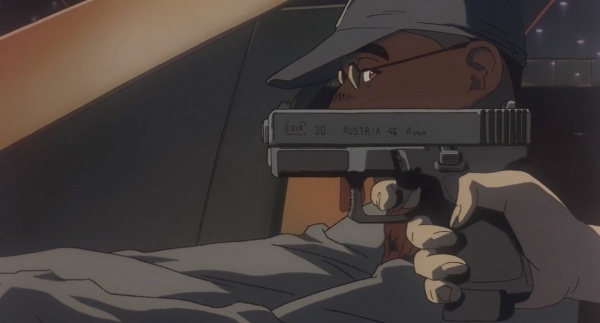 In the train scene, Vincent fires his gun at least 20 times before running out, which is incorrect for the capacity of the .45 ACP model it is chambered in, evidenced by the writing on the shells ejecting from the gun, however, if the animators had gone with .40 S&W or 10mm Auto, this would not be an issue. Vincent shows the security guard his "license". 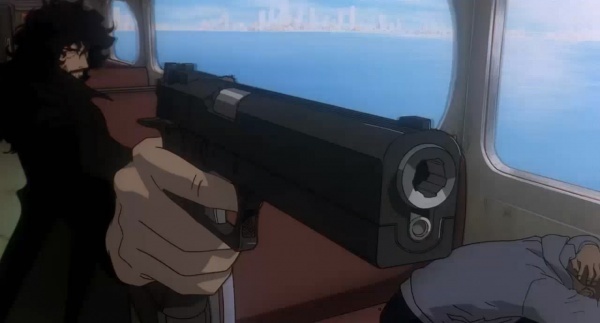 Vincent fires his Strayer Voigt Infinity 1911 at Spike on the train. 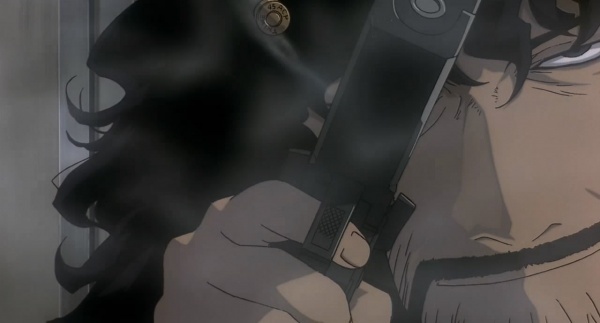 Another shot of Vincent firing his Strayer Voigt Infinity 1911 at Spike on the train. 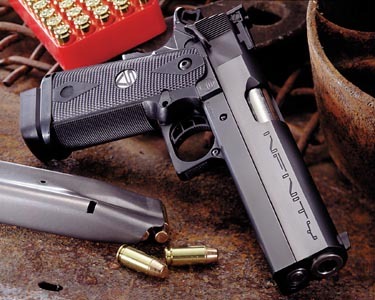 Vincent aims his Strayer Voigt Infinity 1911 tilted just a bit sideways at Spike after reloading. 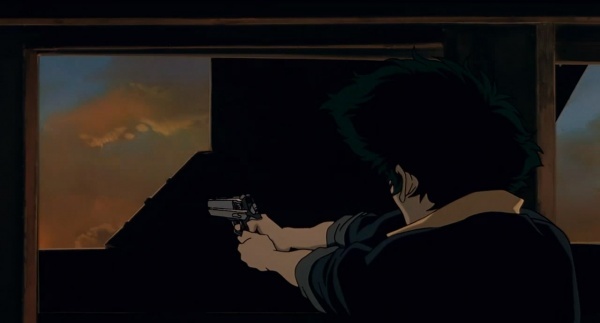 This is probably the best shot of it in the movie. 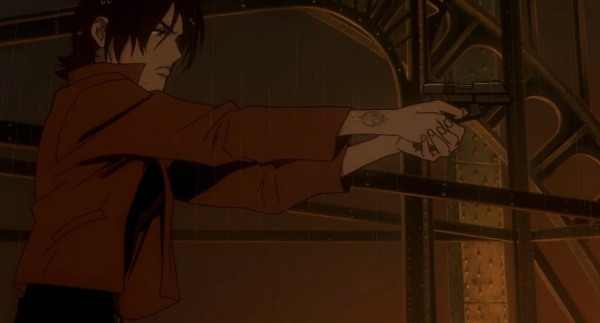 Vincent holds his Strayer Voigt Infinity 1911 on Spike. 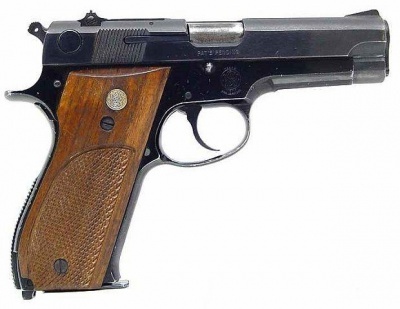 To dissuade any arguments, the shell ejecting from Vincent Volaju's gun is clearly labeled .45 ACP. 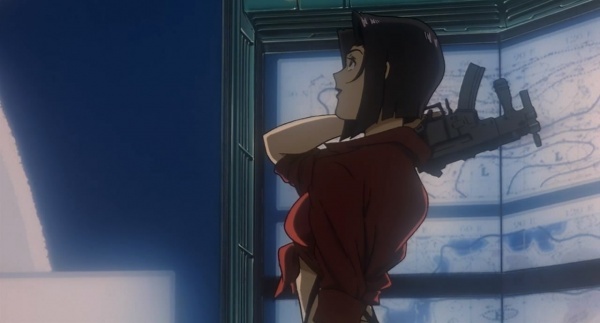 Faye Valentine carries a Glock 30 as her weapon of choice. Faye aims her Glock 30 at the videogame that Lee Samson, her target, is playing. This is the clearest shot in the movie. 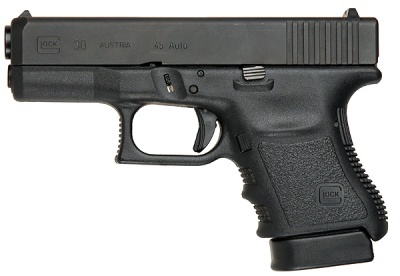 A fictional gun roughly based on the Glock 26 is used by Electra Ovilo in the movie. 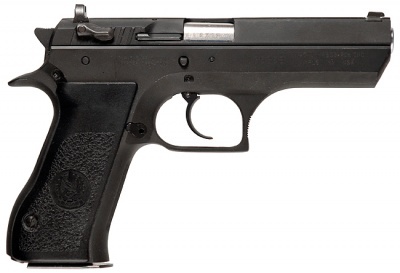 It also seems to have a slide-mounted safety, like a Smith & Wesson automatic. Later on, Spike and Electra use variants fitted with combination compensators/lights. 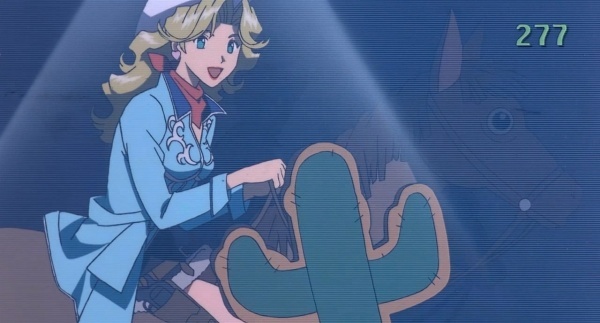 Electra holds her gun on a disguised Spike. 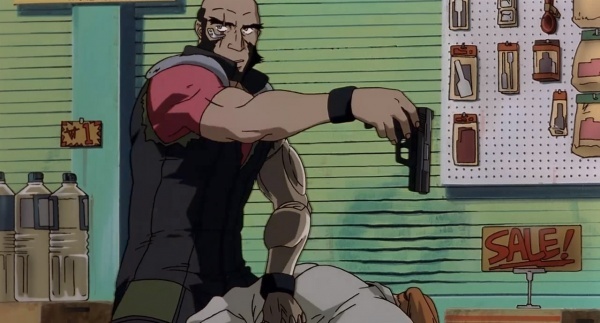 Electra holds her gun on Vincent. 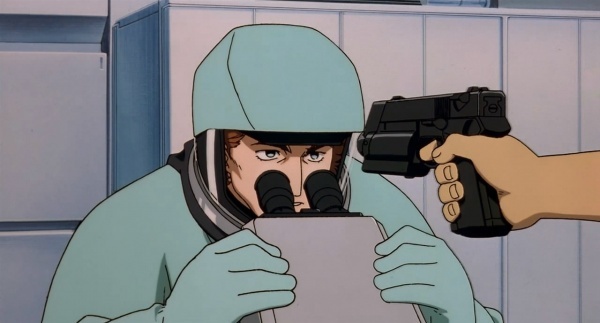 Spike holds a compensated version on a scientist. 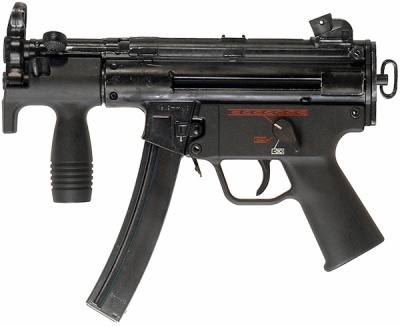 Submachine guns roughly based on Heckler & Koch MP5A2s wiith Surefire dedicated forend weaponlights are used by the ISSP SWAT teams in the movie. 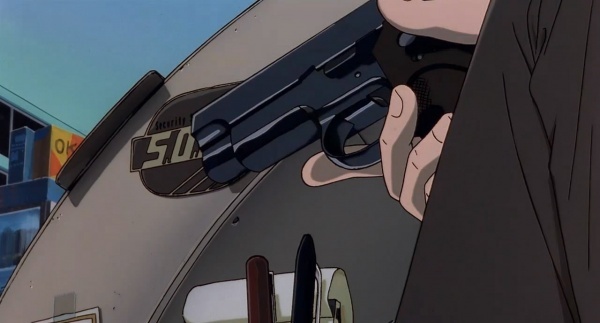 ISSP Teams raid the Water Treatment Plant armed with fictional futuristic MP5A2-like submachine guns. 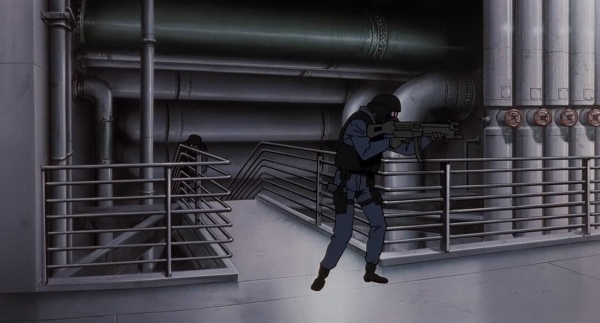 Another shot of the ISSP teams raiding the Water Treatment Plant with their MP5A2-like submachineguns. 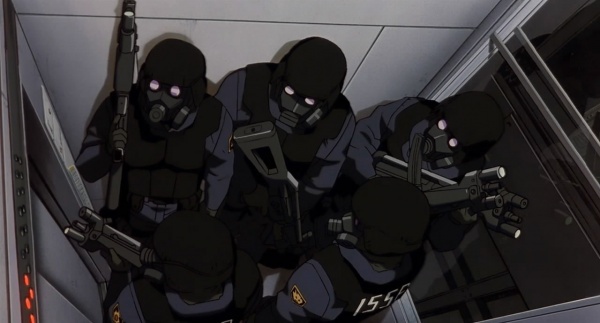 The ISSP SWAT team rides an elevator. 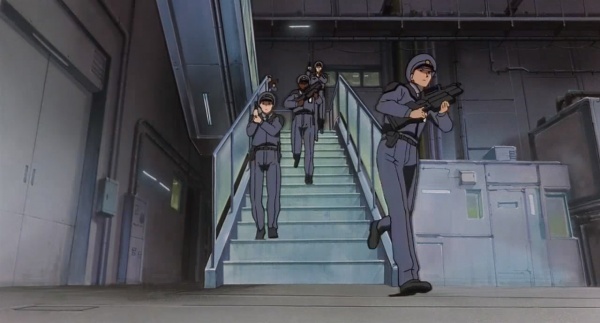 Cherious Medical secuirty guards are armed with fictional "G21 Assault Rifles". 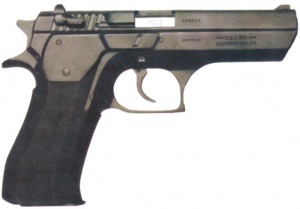 Though the previous author stated that they were Heckler & Koch G11s, there is little resemblance between the guns. Cherious Medical Security mobilizes with their G21s. A Cherious Security Guard falls with his G21 after being kicked in the back of the knee. 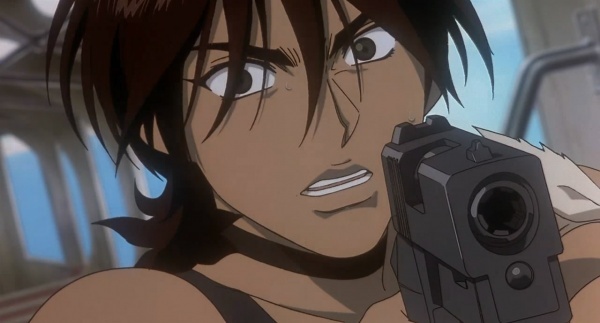 Faye uses a Heckler & Koch MP5K to persuade the people at the Climate Control Center to make it rain. Faye totes her Heckler & Koch MP5K in the Climate Control Center. 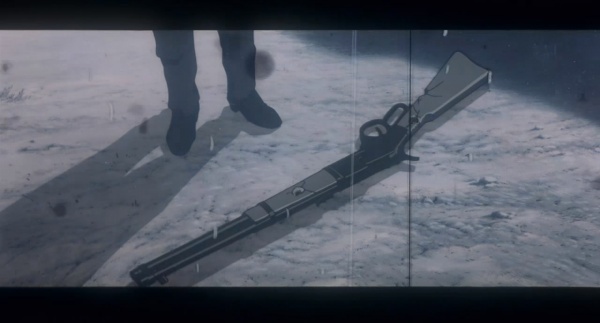 A Winchester Model 1873 is seen in the Spaghetti Western Jet and his former ISSP partner Bob are watching. Winchester Model 1873 carbine, 1st generation rifle - 44-40 Cal. 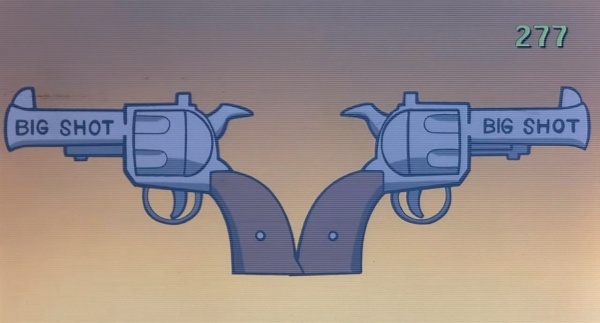 A 7.5 inch barreled Single Action Army with a nickel finish can also be seen in the Spaghetti Western, as well as the usual caricature icon for Big Shots. Punch and Judy appear to be wearing prop SAAs. Big Shots apparently got a bigger budget just before cancellation. Judy is wearing an SAA. A Lewis gun is mounted on one of the planes near the end of the film. The aircraft is actually a Fairey Swordfish, a model famous for its part in sinking the German battleship Bismark in World War 2. 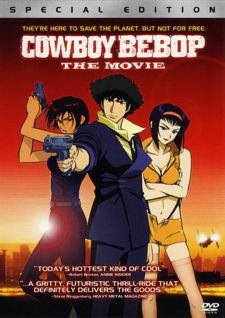 This is a nod to Spike's spacecraft, which is called the "Swordfish II". 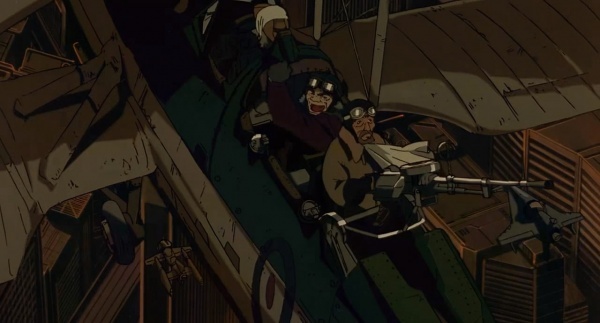 The old men fly their plane while one mans a Lewis gun.